Mother Angelica, founders of EWTN went to her eternal rest on Easter. God bless her work and bring her quickly to his presence. 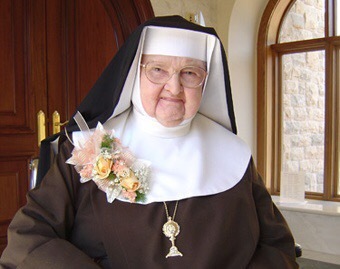 ……..
Irondale, AL (EWTN) Mother Mary Angelica of the Annunciation, P.C.P.A., known to millions around the world as Foundress of the EWTN Global Catholic Network, died peacefully at 5 p.m. CDT, Easter Sunday, March 27, surrounded by the Poor Clare Nuns of Perpetual Adoration of Our Lady of the Angels Monastery in Hanceville, Ala.
Born Rita Antoinette Rizzo in Canton, Ohio in 1923, she entered the Poor Clares of Perpetual Adoration in Cleveland on Aug. 15, 1944 at the age of 21. A year later, she received her religious name – Sister Mary Angelica of the Annunciation. Soon after, the Cleveland Monastery established a new foundation in Canton, and Sr. Angelica was chosen to be a member of the community there. On Jan. 2, 1947 she made her first profession of vows and in January 1953, Sister Angelica took her solemn vows as a Poor Clare nun. In 1956, while awaiting a delicate spinal surgery, Sister Angelica made a promise that, if God would permit her to walk again, she would build a monastery in the South. On May 20, 1962, Our Lady of the Angels Monastery in Irondale, Ala. was dedicated by Archbishop Thomas J. Toolen of Mobile. In Irondale, Mother Angelica’s vision took form and her distinctive approach to teaching the Catholic Faith led to parish talks, the publication of pamphlets and books, then radio and television opportunities. By 1980, the Nuns had converted the garage of their monastery into a television studio. Despite having only a high school education, no television experience and only $200 in the bank, Mother Angelica officially launched the Eternal Word Television Network (EWTN) on Aug. 15, 1981 and served as the Network’s first Chairman and Chief Executive Officer. She famously refused to air paid advertisements to fund her Network, relying solely on viewer donations, despite coming close to bankruptcy on several occasions. More than 34 years later, EWTN is the largest Catholic media network in the world, transmitting 11 separate television channels in multiple languages, reaching more than 264 million homes in 145 countries and territories. The Network now also includes multiple radio platforms, online and digital media outlets, global news services and a publishing group. Known for her humor and ability to colloquially communicate the Catholic Faith to both Catholics and non-Catholics alike, her popular EWTN television show, “Mother Angelica Live” was launched in 1983. Episodes of the program continue to air regularly and have been translated into multiple languages including Spanish, German, and Ukrainian. In addition to the Eternal Word Television Network and Our Lady of the Angels Monastery, Mother Angelica also founded the Franciscan Missionaries of the Eternal Word, a religious community of men based in Irondale. In 1995, Mother Angelica was inspired by God to begin construction of a new monastery and church on a nearly 400 acre site in rural Hanceville, Ala. By 1999, the nuns relocated from Irondale to the new site in Hanceville. Our Lady of the Angels Monastery and the Shrine of the Most Blessed Sacrament were formally dedicated in December 1999. The Shrine remains one of the most visited tourist sites in the State of Alabama. Throughout her life, she struggled with painful illnesses and physical challenges. On Christmas Eve of 2001, Mother Angelica suffered a debilitating stroke and cerebral hemorrhage which took away her capacity to speak. In 2009, she was awarded the prestigious Pro Ecclesia et Pontifice medal by Pope Benedict XVI in recognition of her faithful and extraordinary service to the Roman Catholic Church. This past February, while on board the plane taking him to Cuba, Pope Francis sent a special blessing to Mother Angelica, and asked her for her prayers. Mother Angelica’s final years were prayerful and quiet, spent with her nuns at the Monastery she built in Hanceville. A Mass of Christian Burial will be celebrated at 11:00 a.m. CDT, Friday, April 1 at the Shrine of the Most Blessed Sacrament in Hanceville. Interment will immediately follow in the Shrine’s Crypt Church. Because of limited seating capacity, admission to the Shrine for the funeral Mass will be by invitation only. The public may participate directly outside, in the Shrine’s piazza. Services will be broadcast by EWTN. Further information is available at www.ewtn.com.